For the second straight year we've gotten a January surprise with regards to baseball video games. And for the second straight year, it only nominally keeps Xbox as a relevant platform for Major League Baseball fans. The nostalgic pull of the R.B.I. Baseball name notwithstanding, Xbox 360 and, particularly, Xbox One gamers still have little to look forward to this spring or, to be honest, next spring, too. Though R.B.I. will return to consoles "this spring," there still is no simulation-genre baseball game for either console, and no sign that any games publisher with shoulders broad enough to develop and deliver a suitable game wants any part of the property. R.B.I. Baseball is itself evidence of that, as it is being developed and published by MLB Advanced Media, whose games resume comprises all of three free-to-play mobile titles. The fact baseball is taking matters into its own hands says a lot. 2K Sports, under an agreement stretching 2005 to 2012, never found a way to make that license profitable, and it wasn't solely because of its beleaguered MLB 2K series. Spinoff properties, which includes games like R.B.I., didn't make money either. The Bigs arcade series never made a splash despite releasing in July, one of the slowest months on the game calendar. Rumors persisted that 2K Sports lost tens of millions of dollars each year on a license that, despite paying premium for an "exclusive" deal left open the chance for a game like MLB the Show to effectively shut off half of the console market. Arcade titles, which Sony did not publish for PlayStation in that span, did nothing to recover the lost ground. So an arcade title on Xbox One would, like MLB 2K13 was last year, appear to be a plant-the-flag job. 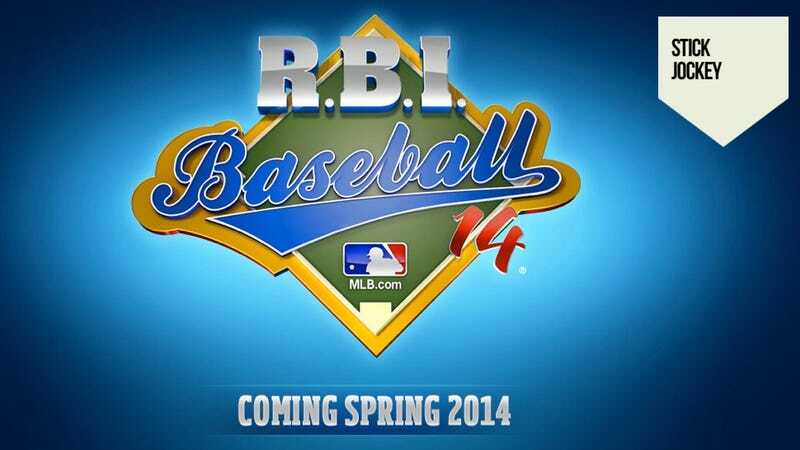 No one can say Major League Baseball isn't on Xbox in 2014, and that's great. But no one can say what Major League Baseball will look like on those consoles, either. Remember, we're only assuming this will resemble or play like Tengen's 1988 classic for the Nintendo Entertainment System. MLBAM hasn't put out any information for the game beyond a basic web page with a logo and a promise the game is coming this spring. MLB Advanced Media's three mobile games all had licensing from the MLB Players' Association, so we can assume that a realistic roster will be a part of this—though Alex Rodriguez's presence, especially as he is suing the players' union, remains to be seen. I emailed MLBPA earlier this week asking about his status. Naturally, I received no reply. It's not as if MLB The Show has been a fount of information, either. If the first-Tuesday-in-March release still is applicable, we're six weeks away from a launch date that has yet to be officially confirmed. Routinely shown in Sony's booth at CES, The Show had no such presence this year and again, has offered no gameplay video and no screenshots beyond some stills of the Fenway Park scoreboard. It could be that, absent any material competition, The Show is setting its own timetable—and avoiding the black-hole effect of the NFL until after the Super Bowl plays in two weeks. The Show might also be moving its calendar closer to Opening Day, when people are most nostalgic for baseball and more inclined to make an impulse buy. But Xbox gamers cracking their neckbones and sweeping the batter's box won't get a serious pitch this year. They're getting a pinch-hit appearance from famous name coming off the bench and a couple of big swings for the camera. Maybe the ball hooks foul, maybe it lands in the stands. We still have no idea who's in the next lineup.